Life is all about give and take. You give a little here and take a little there. With motocross bikes, as in life, you often have to give to get. MXA has scoured the globe in search of the perfect dirt bike for the last 43 years. In these four decades we have come to learn that the pink unicorn does not exist. That is why the world is full of options. Starbucks has 80,000 coffee combinations and, in light of that, choosing between a red T-shirt and a green one is rather basic. 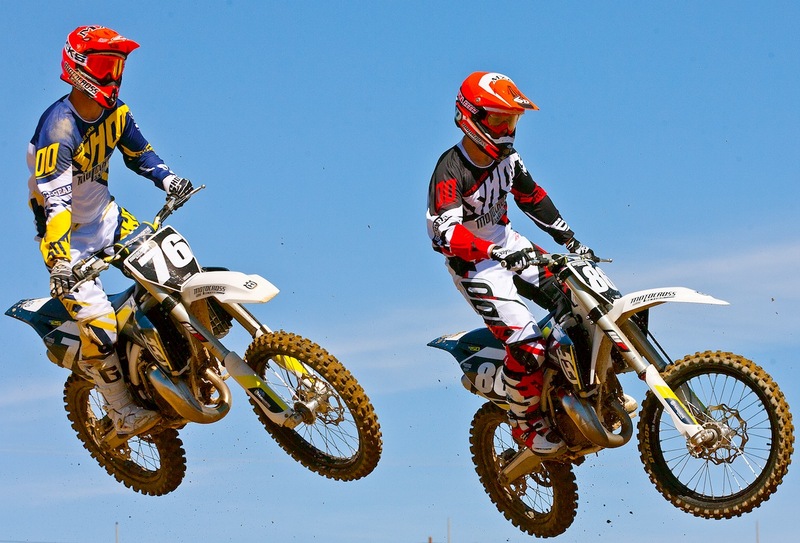 Which leads us to one of the most difficult decisions to make in the motocross world—125cc two-stroke or 150cc two-stroke? Choosing between the two tiddlers shouldn’t be that hard, but given the perfection of modern two-strokes, it is a big deal. Do you give up the fluid dynamics of a perfectly balanced 125 powerband for more punch in the middle? Do you think the extra 2 horsepower will compensate for the lack of syncopated rhythm coming from the broader 125 mill? Do you race? Do you have to live by displacement limits? Does your track have a big jump that a 125 can’t get over cleanly? Do you want that latte in the grande size? HUSQVARNA DOESN’T OFFER A 150cc TWO-STROKE—JUST A 125. 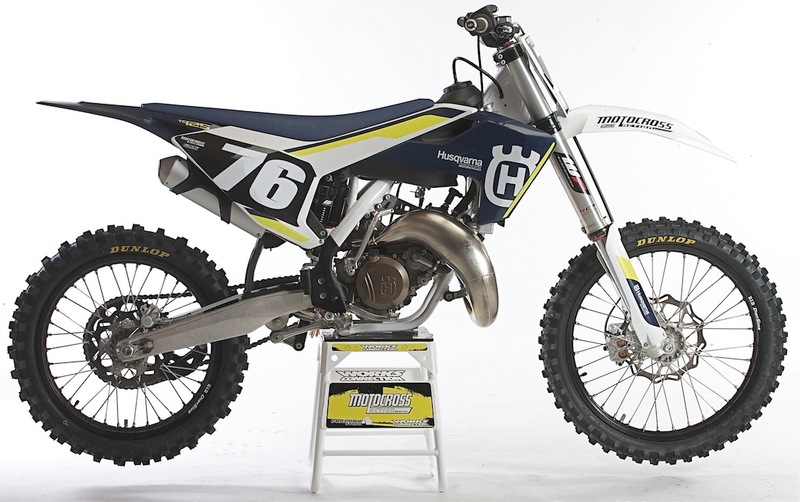 THIS FACT, AND THIS FACT ALONE, MADE THE MXA WRECKING CREW WANT A 2016 HUSQVARNA TC150. YOU ALWAYS WANT WHAT YOU CAN’T HAVE. SO, WE DECIDED TO BUILD ONE. 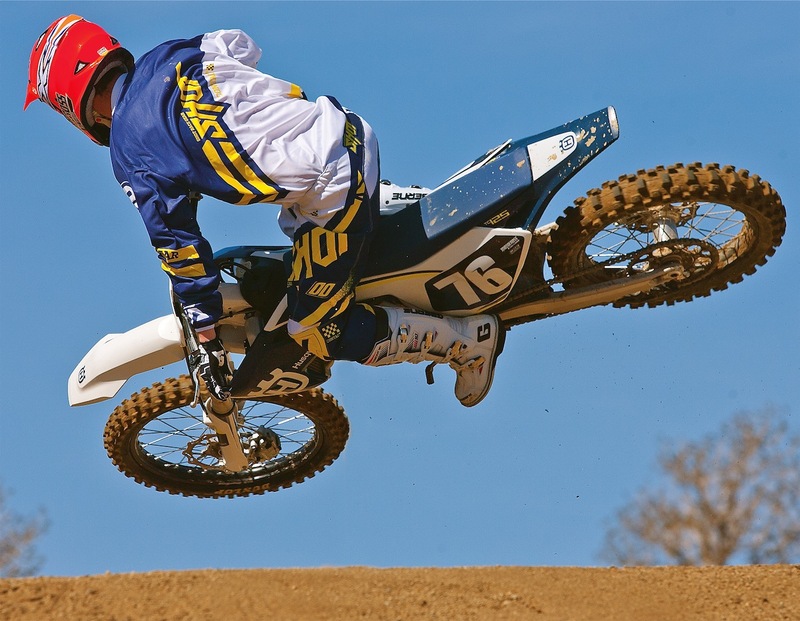 It is no secret that KTM and Husqvarna share platforms and engines. 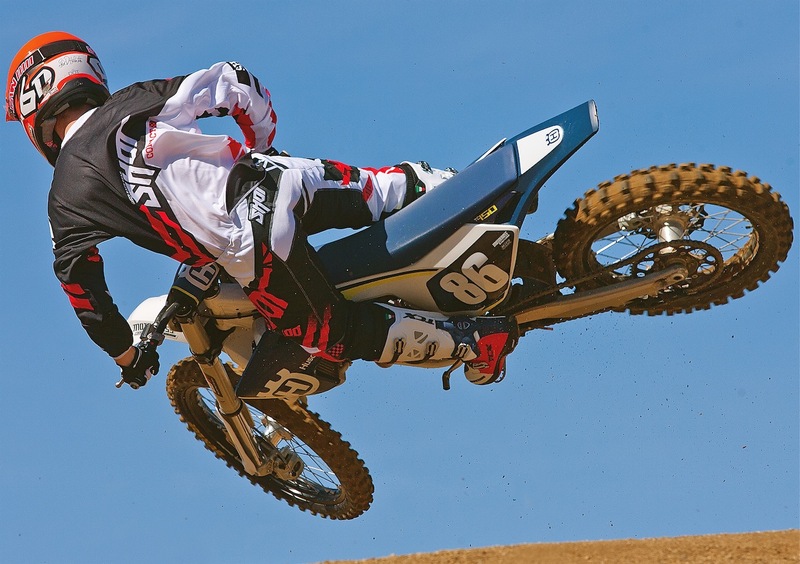 What you probably don’t know is that Husqvarna doesn’t offer a 150cc two-stroke—just a 125. 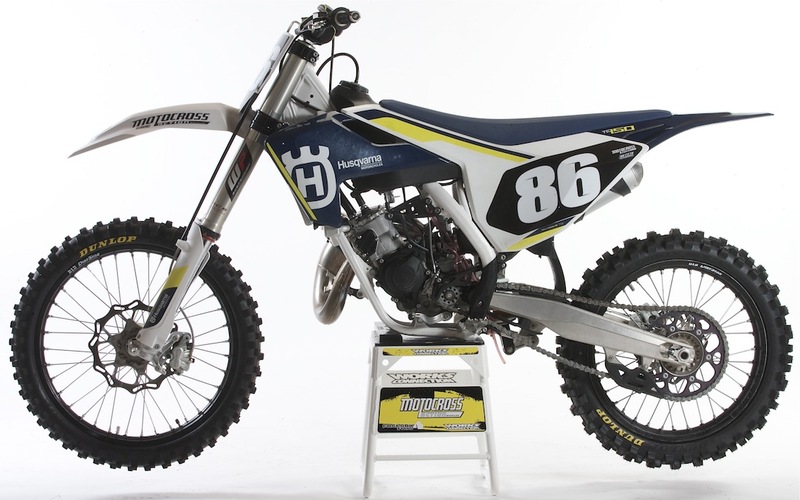 This fact, and this fact alone, made the MXA wrecking crew want a 2016 Husqvarna TC150. You always want what you can’t have. So, we decided to build one—and since we were as confused as everyone who goes into Starbucks about what to order, we decided to take a 2016 Husqvarna TC125 and shoot it out against our kitted Husqvarna TC150. If you build it, they will come. Jumping from the TC125 to the TC150, we couldn’t believe that the only difference was 19cc of displacement. We transformed a TC125 into a TC150 with a pain-free kit that Husky offers. The extra displacement makes it feel like a totally different bike. But first we had to build a TC150. Luckily, Husqvarna offers a $799.99 big-bore kit. All we had to do was order the kit and spend an evening in the garage swapping top ends. Since the stroke remained the same and only the bore was increased, the cases could be left alone. The transition was no tougher than changing a piston and rings. Oh, there were a few tricks to installing the Husqvarna TC150 engine kit, but nothing college-l evel complicated. We had to swap out the black box for the new one supplied in the kit. No big deal; it was plug and play. The jetting had to be changed to a 182 main, 45 pilot and a NOZG neddle (you still have to fine-tune it for your altitude, temperature and riding style). The only parts we had to steal from the TC125 engine was the power valve linkage. We didn’t want to do this, so we ordered all-new power valve links to install in our TC150 engine. Why didn’t we just swap the parts over from the TC125? 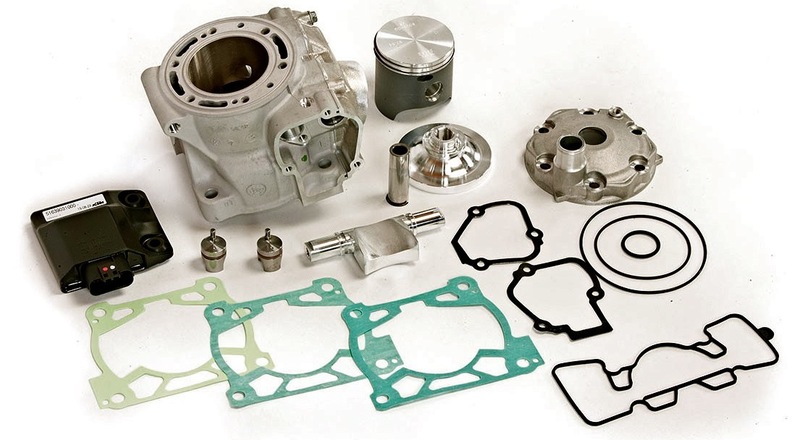 Because if we left the TC125 cylinder intact, we would have a complete 125cc top end (head, cylinder, piston, rings and power valve) sitting on the shelf for when we needed it—with no extra work required to swap the top end out. We might have gone a little overboard, but we love having options at our fingertips. THE TC150 POWERBAND STARTS OFF LACKADAISICALLY, LEAVING THE RIDER NO CHOICE BUT TO ABUSE THE CLUTCH. THEN, IN THE MIDRANGE, BOOM! IT HITS LIKE A LEFT HOOK FROM MIKE TYSON. If we hadn’t put different numbers on them, we couldn’t tell the TC125 from the TC150. The transformation is simple enough for anyone who is mechanically inclined or has changed a two-stroke top end before. Before you start checking part numbers to see which parts to order, relax. Husky makes it easy. Husqvarna offers one part number for one box that includes every part you need to make the switch (save for the power valve links that you have to switch over from your old engine). Once we buttoned up our brand-new 2016 TC150 top end, we rolled it out to the track with our equally brand-new 2016 TC125. Yeah, yeah, we have a hard life. But, our goal was to take the MXA wrecking crew and spend a day going back and forth between the two machines. We would take notes, do laps, shoot photos and jot down every utterance that the typical erudite MXA test riders made during the day. But, most of all, we would have a blast. The compact engine of the TC125 is a fireball, although it can be boring at times. We were looking for punch, and that is what the TC150-kitted engine delivered. So, what did we find out? Which one would we prefer to ride? What makes one bike better than the other? Is horsepower more important than usability? What’s the verdict? It’s most important to note that in stock trim the 2016 Husqvarna TC125 is a very good overall package—with the bonus that it is sitting in the showroom ready to ride, which you can’t say about our TC150. The TC125 engine has a gradual pull from the bottom to the top without any dips, bogs or stutters. The over-rev is a thing of beauty, and the shift points are easy to hit. Surprisingly, the exact same WP 4Cs suspension that works so crudely on the Husky and KTM four-strokes is well-balanced on the lighter and less powerful TC125. As it sits, it is a great bike to race. It doesn’t suffer from powerband shortages, doesn’t fall off the pipe and doesn’t require the racer to exert undue energy. Overall, it is an easy-to-ride machine, but it doesn’t have any pizazz of its own. You have to add that with creative riding. Between the Husqvarna TC125 and the TC150 we built, the two bikes have unique personalities. Jumping from the TC125 to the TC150, we couldn’t believe that the only difference was 19cc of displacement. Although the bikes look identical, so identical that test riders often got on the wrong bike by mistake, they are completely different animals on the track. The TC150 powerband starts off lackadaisically, leaving the rider no choice but to abuse the clutch. Then, in the midrange, boom! It hits like a left hook from Mike Tyson. This midrange punch squats the rear end and catapults the TC150 over jumps. In truth, we had test riders give it everything they had on the TC125 and still come up a few feet short over big booters, only to have them flatland the same jump on the TC150. The midrange is the strong point of the TC150. It’s still good on top, but it does have some quirks. Remember when we said that this is a give-and-take world? The TC150 gives you 2 extra horsepower, but that power isn’t as fluid or universally usable as the TC125’s powerband. If the next gear isn’t hit at the perfect moment, the TC150 falls on its face. This makes the shift points short and tricky. Additionally, with the TC150’s powerful punch and shorter powerband, the WP suspension that felt so balanced on the TC125 feels erratic at times. The added load of more ponies pushes the WP components up to the same feel they have on the four-strokes. If you want a Husky TC150 two-stroke you have to build it yourself, but this kit has everything you will need. Make no mistake about it, the TC150 has flare. It’s punchy, powerful and able to clear tall buildings in a single bound, but that’s all it has over the TC125. When we started racing the two bikes, not just against each other but against other 125s, 150s and 250 four-strokes, most MXA test riders preferred to race the TC125 instead of the TC150. Why? It was more fluid from gear to gear, didn’t punish mistakes as severely and saved energy. The test riders were willing to give up the possibility of a better start and the ability to boost big jumps in order to turn quicker lap times. We like that Husqvarna offers the option to make a TC125 into a TC150, but most of all we like that the 150 kit allows us to have two bikes for the price of one. Yes, we know, we have two bikes for the price of two, plus the cost of the 150 kit, but we were thinking of you. We enjoyed riding both bikes, and we wouldn’t say one was better than the other, but we would say that if you are a play rider, professional practice rider or a guy who just likes to jumps things, go with the TC150. If you’re a serious racer, stick with the TC125. Both bikes have advantages and disadvantages; however, neither is a pink unicorn.